Dean Baker has long argued the problem was not just the debt overhang but the wealth effect’s sharp shift into reverse when the housing bubble burst. That’s similar to Mian/Sufi except it implies that even had you forgiven the debt, consumption still would have tanked. Brad DeLong articulates an “all-of-the-above” theory, suggesting each of these analyses gets at one part of the problem but you need all of them to understand what happened. “Fog lights” in this context mean you have to do everything you can to get the system back up. You have to reflate the credit system through both liquidity (as in the TARP) as well as Mian/Sufi-style principal reductions and cramdowns of mortgage debt that cannot realistically be serviced without sustained pain. The administration did a lot of the former and little (not none) of the latter. Why not? From where I sat, and I didn’t see everything from my seat for sure, it was less about protecting creditors per se than the belief that breaking contracts was an interventionist step too far (though the fact that this principle was less active in the auto-bailout suggests a protection that extended more to white than blue collar industry). It was also argued at the time that the administration tried to get Congress to write legislation allowing bankruptcy judges to allow cramdowns on primary residences but the members uniformly said no. You ask me, I think we didn’t push hard enough, again, based on the perceived sanctity of debt contracts. Dean’s point means that debt forgiveness and revived credit flows must be met with deep fiscal stimulus that lasts as long as needed (he also emphasizes the demand-zapping role of the US trade deficit). No question that accelerating the deleveraging cycle will hasten the recovery, but as long as unemployment remains high, job growth slow, and real wages flat, demand will be seriously constrained by the negative wealth effect, even as debt forgiveness dampens that dynamic. With the private sector still licking its wounds, absent committed stimulus there’s no reason to expect deleveraging, or even aggressive monetary policy, to trigger the growth needed to reach escape velocity. In fact, you might expect to see a pattern as in the figure below, which plots households’ debt service as share of disposable income against real, year-over-year GDP growth. 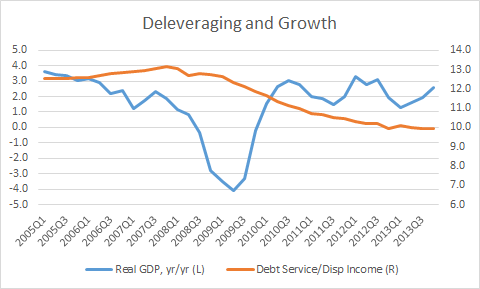 Deleveraging would have surely been faster with more debt forgiveness, but without doing more to offset the crashing wealth effect, we may have still been in the slog you see there: basically, a return to trend growth before the output gaps were closed. To be clear, the administration did, in fact, respond quickly and effectively with precisely this stimulative “fog light” but the headlights dimmed before the fog cleared. Why? Because of a precipitous pivot to deficit reduction. And, of course, aggressive stimulus was not accompanied by aggressive debt reduction. So I’m with Brad—all of the above. And let’s keep it real: the problem was not only that we didn’t do all of the above. It’s that even when we did the right things, we didn’t stick with them long enough. The important thing now is to try to learn from our mistakes, and I for one am thankful to all of these authors for continuing to plumb these deep waters. Share the post "Diagnoses and Prescriptions: The Great Recession"
8 comments in reply to "Diagnoses and Prescriptions: The Great Recession"
This is really annoying, frustrating, and gratifying that I keep beating the New York Times (and this blog) reporting on recent economic research (depressed housing market stifles recovery), not to mention the super highly publicized attention given to the latest policy proposal to address inequality by taxing wealth. How does anyone think debt levels aren’t historically elevated and pose a continuing risk to the economy, while feeding the bloated financial sector, the 1%, and draining resources, suppressing demand and preventing recovery. Here as a reminder is a link and excerpt of comment made Feb 8, before Piketty’s book came out advocating wealth tax. Of course I was familiar with Piketty’s work, and also that France did in fact have a wealth tax (as we do in a way with the estate tax). Notice how Piketty proposal changes debate, moves goalposts, allowing progressives to advocate restoring New Deal and income rates by giving them breathing room, providing extra space on the left, making them appear more moderate. At least that’s exactly how I pictured wealth tax proposals to work. “Finally, no, even the very modest and within the existing system changes outlined above, nothing can happen unless the 1% controlling 20% of income fear something worse will be done unless changes are made. Read my comments first or read the story in the Times later ( a few days, months, or years). But it’s only because we look at the same data and I don’t write books so I can publish faster, here. Piketty’s book did come out in France in 2013, but I was not aware of it until the recent publicity surrounding the English edition. I found Saez and Picketty’s data while researching national income because the census data was inadequate. Specifically national income data didn’t match census because census under reported high income. I found this out well before a study came out last September on this very subject. Also allocating capital gains is especially difficult, as I was trying to determine how much capital gains went to retirees. Is It Real or Is It Another Bubble? (August 2002) before you complain no one but you saw “IT” coming. Just because you pre-empt the NYT doesn’t mean you hit a half court shot first. Jareds point is that “IT” was seen coming and our policy response was inadequate for the same political reasons your good ideas are not going anywhere. A fella could get heist on his own petard when he lets it fly. ( How can one be annoyed, frustrated and gratified at the same time?). Not exactly Fonzie Jumping the Shark. I did not say no one saw a bubble. I never said no one saw the bubble. I have actually said the opposite having read Krugman and others describe before the bust that we’d become a nation of real estate buyers and sellers and have commented about that somewhere. What I specifically referred to as to being prescient was my recent comment that the housing market is still in serious trouble, is still having a huge effect on the economy, citing my sources with links. You have a financial crisis caused by housing, so what should you do? Maybe you should fix it. The counter to the housing argument has been secular stagnation and the need for inflation, as if weak demand wasn’t the cause present troubles and fiscal stimulus isn’t the cure. But we hear only the bubble kept the economy even slowly moving as if real estate investment compares favorably with capital investment or education, and as if it didn’t mask the inequality and also that inequality isn’t a direct cause of the weak demand. To be fair, Krugman has complained intermittently and forcefully about housing, especially Fannie and Freddie not allowing principal reductions. But that’s controlled by Obama, it’s not just Republicans blocking action. Again if these things are so easily known, why is so little done? The policy response to the crisis was inadequate because Larry Summers had a great misconception about the limits of the deficit and kept the stimulus too small (according to Krugman), and Geithner structured the bailout in the way least harmful for banks, especially their management and stockholders (big profits and same people running the show), Obama is a centrist. The idea that true progressive legislation can not pass is a big lie foisted by sell out Democrats more concerned with their incumbency than promoting progressive policy. What is holding back our economy is income inequality. If the total Adjusted Gross Income reported by all tax filers in 2007 (before the Great Recession) had been divided the same as it was in 1980 then each of the 40% of filers with enough income to be in the top 50% but not enough to be in the top 10% would have received $16,000 more in income. That kind of increased income would go a long way toward reducing the household debt overhang with enough left over to have our economy growing briskly. The Social Security Trust Fund would have $3 Trillion more in it without the increase in income inequality since 1980. Income Inequality is the problem. Since I favor 90% marginal top tax rates on income over $2 million, and the credible movement (threat) of taxes on wealth, I also agree inequality is the main problem. I advocate the confiscatory tax rates as part of a plan to help restore the New Deal, by using the proven ways of reducing inequality with taxes. As such, I do not foresee the need to redistribute the income so taxed, except in the form of depression induced temporary infrastructure stimulus, and aid to students for education accompanied by measures to reduce tuition. Basically college is the new high school and should be free and the student debt load contributes to rising inequality while also inhibiting recovery. Since it will take some time for these tax measures to be enacted, for the stimulus to help recovery, for full employment to gradually increase wages, especially since incentives to reward executives and exploit workers to increase profits will be greatly reduced, something would still need to keep people from losing their houses, and also help restore equity. Addressing the effects of a housing bust would be necessary even absent inequality. One could make the case absent the greater inequality there would be no housing bubble and bust. Ok but we got one now, so it’s efficient to deal with it directly. If principal is reduced, and neighbors are upset that their principle is not, maybe someone should explain to them getting to the brink of foreclosure probably means your credit is ruined for seven years, which can kind of stop you from being able to move and collect the profits of the reduction any time soon. Labor rights and equal pay are also biggies necessary for greater equality. It’s not an either or. Raise taxes to restore equality, stop throwing people out of their homes because the economy and banks made 20% of them underwater. The lack of debt forgiveness was a double whammy in that people lost their homes and then the banks did not take care of the homes and whole neighborhoods got destroyed. It would have saved the banks money to let people stay in their homes rent free but too many in power did not want to give what appeared to be a gift to “those people.” These are folks who had been taken by banks once when they got their loans and then they were expected to fill out another bunch of forms and deal with banks that could care less to get help. The banks should have been told to send out letters saying their new loan payment is now a much lower. But these are people with no political voice in this country and as usual they got the raw end of the deal. That’s the usual vague hand-waving, as if civics didn’t matter. There was significant public and political class opposition to any bailout of underwater homeowners. The stimulus passed by 3 votes – bought at huge cost. The press was fanning the flames of “populist” anger at homeowner bailouts 24/7 and the weak Dem majority in the Senate buckled completely. And yet, somehow, President Obama was supposed to wave his magic wand, despite his inability to even replace GSE management, fix a 30 year problem of wage diminishment by, I don’t know, making a damn speech.